The highly rated Kensington pizzeria has expanded to a second location — this time with a full bar. Benchmark Pizzeria, whose original location in Kensington earned praise from the Express in 2016, opened its second location in Old Oakland on Oct. 4. According to Benchmark’s general manager, Corin Weihemuller, owners Peter and Melissa Swanson originally met in Oakland while working at Oliveto, so they always hoped to open a second location there — and when the Old Oakland space became available, they jumped on the opportunity. At Benchmark’s Old Oakland location, everything revolves around pizza — literally. The owners kept the same wood oven from the previous tenant, Desco, but remodeled the space so that the wood oven could take center stage. Peter calls his style of pizza “Neo-Neapolitan.” It’s Italian-inspired with a few twists. 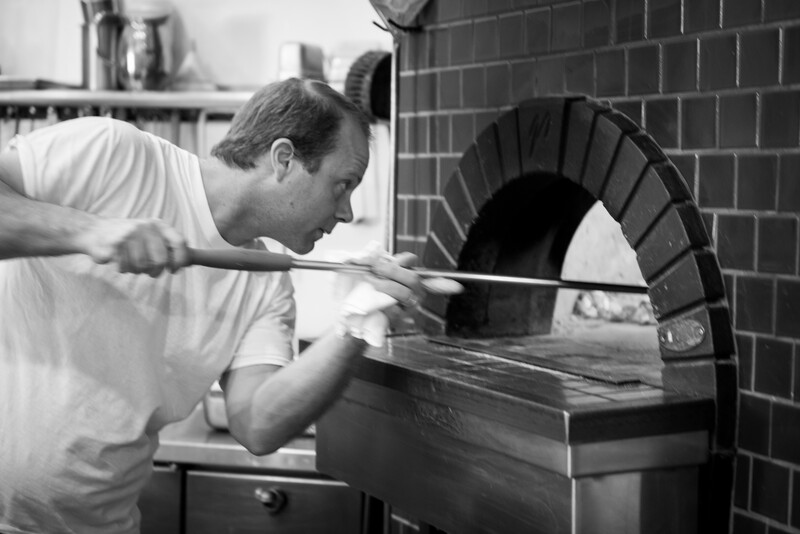 The pizzas are made with a unique yet temperamental sourdough using a starter that Peter has kept alive for over seven years. One of the Kensington location’s most popular pizzas is a fried sage pizza with house-stretched mozzarella, parmesan, brown butter, lemon, and shaved garlic. That pizza will be available at the Oakland location, too, along with a salami and Calabrian chili pizza, a mini charm tomato and fennel pizza, and more. The Old Oakland location has a bigger kitchen, which allows the Swansons to expand the menu to include more entrees, such as chicken alla diavola and short rib ragu with gnocchi. Benchmark uses locally sourced, sustainable, and organic produce wherever possible, so there’ll be some seasonal changes to the menu. On the menu for fall is a farro and delicata squash salad with pomegranate. While Benchmark’s original location only serves beer and wine, the Oakland location features a full bar with cocktails designed by Tamir Ben-Shalom of Bull Valley Roadhouse in Port Costa. Weihemuller said the “inventive, yet accessible” cocktail menu is designed to reflect the food. Amaro-based drinks are the highlight of the menu. The On the Down Low cocktail features Lo-Fi Gentian Amaro, Dolin Blanc vermouth, and Fino sherry, while the New Wave Tiki combines Mosswood Day rum, lime cordial, balsamic vinegar, Giffard Crème de Mure, and Amaro Aplomado. Weihemuller said that opening night went smoothly, and the Benchmark team is excited to be up and running in Oakland.